Biscuit rotti is a rich rotti stuffed with spices and a popular breakfast or evening snack in GSB cuisine especially prepared when guests comes home or when you have ample time.There are various methods of preparing this rotti. 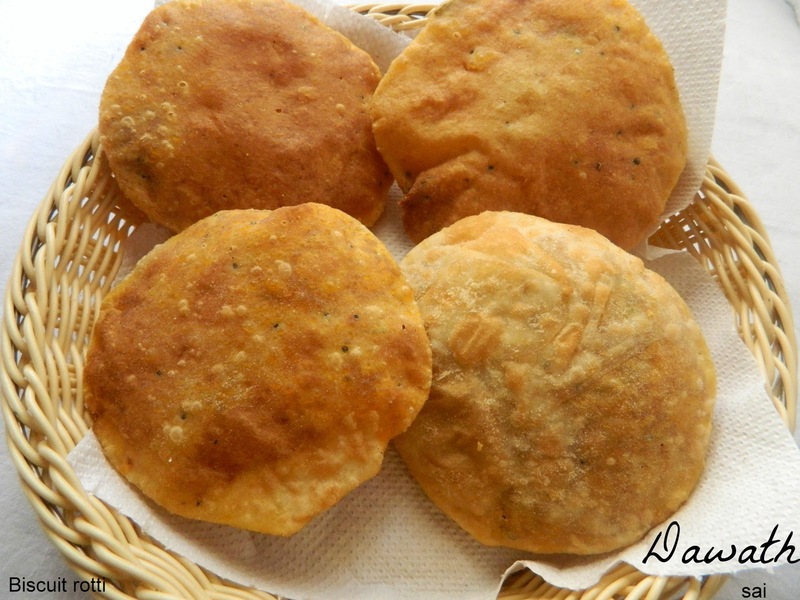 This rotti is spicy and crispy and resembles like kachori. Goes well with a sip of piping hot coffee or tea and makes an excellent evening snack.Whenever we expect unexpected guests and are short in time we get biscuit rotti from Balli’s angadi (shop) who sells these rottis and other fried munchies like hot cakes.There is so much demand for his fried munchies that people just flock around in the evenings.In Mangalore few follow the tradition of eating their evening snack either in Balli’s angadi or Taj mahal restuarant….These rotti s stay puffed and crisp for a long time. This recipe and rotti is a contribution from Santoshi.I will update with stepwise pictures when I prepare it . Grind grated coconut,red chillies,coriander leaves without adding water to a coarse mixture. Heat oil ,splutter mustard seeds,add urad dal,cumin seeds,curry leaves and hing. Add chick pea flour and suji and roast it for sometime. Add the ground mixture,turmeric powder,check spice,if you want more spicy add chilly powder. Add a pinch of sugar,salt and coriander leaves. With the help of your hands prepare tight small balls with the mixture and keep it aside(just like small ladoo). Mix all the ingredients of the puri and knead it into stiff dough and cover it with a damp cloth and keep it aside for few minutes(10 -15 minutes). 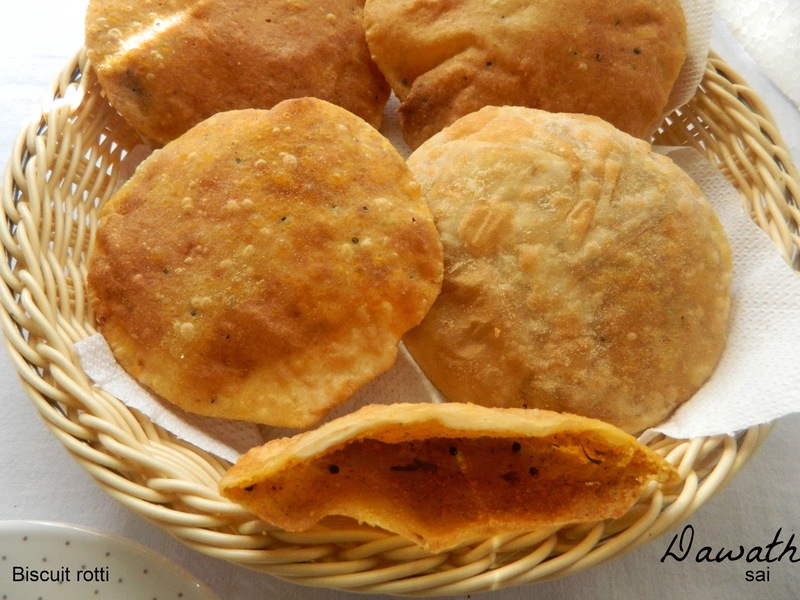 Pinch small balls from the dough and roll into small discs about 3 -4 inch diameter like puri. Place a pellet of mixture on puri and cover up fully by gathering up the edges and sealing all the sides. Roll it again delicately into a disc or puri. Heat oil and deep fry in hot oil with the help of a perforated ladle by pressing at the centre of the puri to puff up after you drop the puri in the hot oil until it turns brown in color. You may also substitute the dough with Semolina instead of wheat flour.